Breach & Boltz join forces as A-Diction once more for their sophomore release, following some mixtapes and an EP. The album Walkin’ Alone features beats by M-Phazes, Jase, Mules, Lewis One and Whisper and rounds out the track listing at 15 tracks. We’ll be posting a short review of the album in the next day or two. The name A-Diction says it all; wordplay, cleverness, and an overall obsession with the previous two points. Born and raised in Melbourne, the duo consists of MCs Breach and Boltz. Breach, the precise wordsmith with focussed flow and witty punchlines, and Boltz, the crooner known for his explosive debut album ‘The Wishlist’, which featured international heavyweight Royce da 5’9” and local producer extraordinaire M-Phazes. Yet, having released a number of well received works (2005’s ‘To be Announced’ EP; last year’s ‘The Three Year Itch’ mixtape and more recently the ‘In Good Company’ mixtape), the group have never released a full length LP; until now. Their debut album, ‘Walkin’ Alone’, was painstakingly crafted from the rough and tumble reality of Melbourne life, and is best summarised by the events that led up to its release; it is an album that is bipolar in its thinking, a colourful swatch book of memories and observations that flitters between the lows of poverty and despair, and the highs of friendship and hilarity. Years in the making, the LP has left no stone unturned when it comes to actively seeking musical collaborators; A-Diction have spared no expense in working with the likes of M-Phazes (Drapht, Bliss N Eso), Jase (Phrase, Daniel Merriweather, Pegz), Whisper (Equills), Lewis One (Twice As Nice) Mules (Hyjak N Torcha, Choose Mics) and enlisted the vocal talents of Vida Sunshyne and Bekah. Behind the mic they are joined by a broad spectrum of respected and up and coming MC’s with Haunts and G-Force making memorable contributions; in addition Scott Burns, Billy Bunks, Whisper, Raven and Fraksha join A-Diction on a posse cut that is sure to be an instant underground classic. Meanwhile Doc Felix, DJ Mathmatics and DJ Juice provide some world class cutting on the album. Available nation wide through Obese Records Distribution on August 6th 2010, the album, 4 years in production, reinforces the adage that good things come to those who wait, and clearly demonstrates the power of quality over quantity. Backed with some impressive artwork by renowned illustrator R. Lyons, ‘Walkin’ Alone’ is a definitive all in one package; a fitting debut for artists with ten times the commercial success, let alone two poetic Melbourne partners in rhyme. 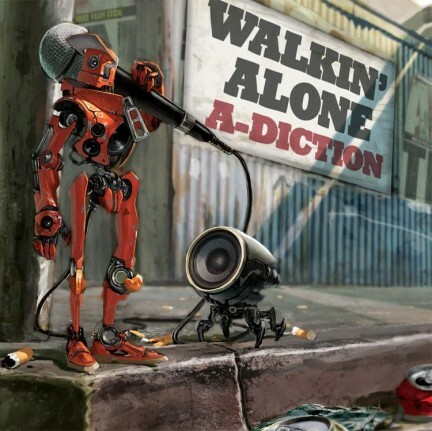 A-Diction’s new album Walkin’ Alone is available now through JB Hifi or grab it digitally on iTunes.